1. Heat 1 Tbsp broth in large pot over medium heat and sauté garlic, onions and leeks. 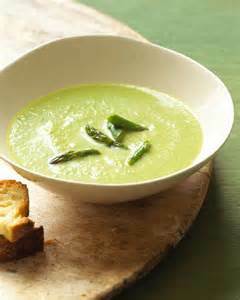 Add celery and asparagus and cook for 3-4 minutes, stirring constantly. 2. Add the rest of vegetable broth and bring to a boil, then immediately reduce heat, partially cover and allow to simmer for 25-30 minutes. Stir occasionally. 3. Let soup cool a few minutes. Transfer to a food processor and blend until desired smoothness. 4. You can drink soup as is or reheat in a pot. Add a tiny bit of sea salt and pepper.